As a first officer with American Airlines, previous captain with its regional airlines, and a veteran flight trainer, Tan Hao says the key to leadership is to be a good listener and have patience. 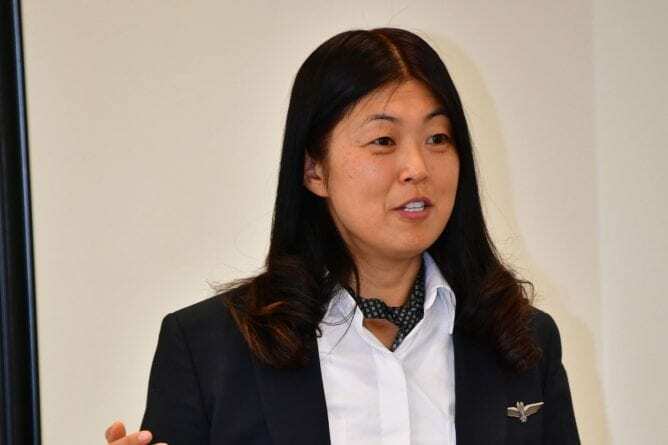 Securing special permissions from American Airlines to wear her uniform and share “in-flight” snacks, Hao spoke to the MNGT 463 Organizational Leadership class about authentic leadership and her journey through adversity to become a commercial airline pilot. As a woman born in rural China, Hao knew that according to culture and tradition she needed to make her parents proud by learning domestic skills and marrying a good husband. When her father died, Hao took it upon herself to take care of her mother and gave up on her own dreams. But after developing entrepreneurial skills by selling caramel apples to her classmates, and seeing her older brother excel, Hao urged to do more. “If my brother couldn’t do it, I wanted to do it. I had nonstop ideas and had to achieve more than what my family expected of me,” she shared with the students. Hao ran a gift shop at the age of 16 and eventually earned enough money for her mother’s retirement and her brother’s voyage to the US. She, too, moved to the US to obtain a bachelor’s degree in economics as well as a master’s degree in information systems. Hao worked in corporate marketing for financial institutions, a job she soon quit to further pursue her lifelong dream of being a pilot. Hao ran a gift shop at the age of 16 to help her mother financially and to save for college in the United States. After obtaining her bachelor’s degree in economics, she worked to save money for her mother’s retirement and to help her brother apply for graduate school. Hao later received a master’s degree in information systems and worked in corporate marketing for financial institutions – a job she soon quit to further pursue her lifelong dream of being a pilot. “I never had a comfort zone. What else would I do for entertainment other than taking on challenges?” Hao said. Hao later became a FAA Gold Seal Certified Flight Instructor in Daytona Beach, FL and Phoenix, AZ. She learned the importance of finding a balance in order to not overwhelm her trainees and letting them develop their own fine line between procedure and technique. Hao had a 100% pass rate for her students, which is very rare, ranking her at No. 1 among hundreds of flight school instructors. “If you want them to do well, you’ll really take the time to listen to them and demonstrate what needs to be done, so that they can build confidence and be successful,” she said. Fearing disapproval, Hao never directly told her family that she was a pilot. Her brother later found out when he was helping her with her tax returns, because she had it listed as her occupation. After some time, her family proudly accepted her achievements. Hao noted that it wasn’t until after she could define implicit bias, unconsciously held set of associations about a social group, that she recognized how it not only affected her family’s thoughts, but also her own understanding of the world. “Once I learned about implicit bias, I made the conscious effort to see how my own actions affect others,” Hao said. Hao’s awareness for implicit bias has helped in her current role at American Airlines, where 96% of pilots are men. Currently based in New York, she is type rated to fly the Boeing 737, Bombardier CRJ and Embraer ERJ. Hao was invited to campus to share her story by management and leadership assistant professor Mariana Lebrόn, Ph.D.
First Officer, Hao also taught the MNGT 463 students about three management approaches: Threat and Error Management (TEM), The Swiss Cheese Model and the Checklist. She left the class emphasizing the importance of asking questions and building confidence.